This arti­cle is pub­lished with kind per­mis­sion of “Chi­nese Defence Today — sinodefence.com”. Chi­na began its pre­lim­i­nary stud­ies on the nuclear war­head tech­nol­o­gy even before its first atom­ic bomb test. Three years after China’s first nuclear test, the first mis­sile-deliv­ered atom­ic war­head was suc­cess­ful­ly test­ed in Octo­ber 1966. 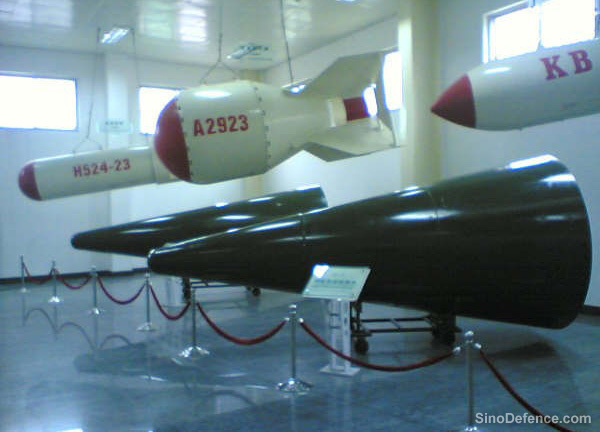 Chi­nese lead­er­ship also decid­ed that the mis­sile-deliv­ered nuclear war­heads should be the pri­ma­ry weapon for China’s future nuclear strike capa­bil­i­ty, with the air-dropped nuclear bomb being sec­ondary. 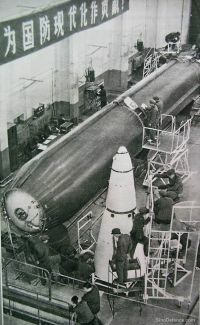 In 1964, Chi­na began to devel­op an oper­a­tional nuclear war­head based on the design of China’s first atom­ic bomb for the DF-2 (CSS-1) medi­um-range sur­face-to-sur­face bal­lis­tic mis­sile. The pri­ma­ry devel­op­ment tar­gets were to reduce the weight and size of the bomb and enhance its struc­ture for mis­sile launch and flight. Bei­jing Nuclear Weapon Research Insti­tute began to devel­op a nuclear war­head safe­ty, arm­ing, fus­ing and fir­ing (SAFF) sys­tem in the mid-1960s. The sys­tem would make sure the war­head is not det­o­nat­ed by acci­dent dur­ing the its life­time and explodes when deliv­ered to tar­get. The sys­tem received exten­sive non-nuclear explo­sion tests and flight tests on the mis­sile dur­ing its devel­op­ment. The insti­tute also con­duct­ed var­i­ous tests on the nuclear SAFF sys­tem includ­ing sim­u­lat­ed fire and falling from height. The test results ensured that the war­head could not be det­o­nat­ed by acci­dent before it is armed. 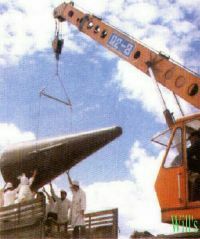 Chi­na launched a DF-2 mis­sile from the Shuang Cheng Tzu mis­sile test base on 7 Octo­ber 1966 to exam­ine the reli­a­bil­i­ty of the missile’s self-destruc­tion mech­a­nism. The mis­sile was suc­cess­ful­ly destruc­t­ed under the ground com­mand. Between 13 and 16 Octo­ber, anoth­er two ‘cold tests’ (mis­sile car­ry­ing sim­u­lat­ed war­heads) were car­ried out as the final tests before the “hot test” with a live nuclear war­head. On 27 Octo­ber 1966, a DF-2 mis­sile car­ry­ing a sin­gle atom­ic war­head was launched from the Shuang Cheng Tzu base at 09:00 local time. At 09:09 the mis­sile reached the Lop Nor nuclear test site in Xin­jiang and suc­cess­ful­ly det­o­nat­ed at 569 metres above the ground sur­face. The suc­cess­ful test of the first mis­sile deliv­ered nuclear war­head marked the Chi­nese nuclear weapon pro­gramme had reached oper­a­tional weapon deploy­ment phase. Batch pro­duc­tion of the nuclear war­head for the DF-2 mis­sile began in 1968. Devel­op­ment of the first-gen­er­a­tion hydro­gen (ther­mal nuclear) war­heads began in 1967, with the mot­to, “small size, quick maneu­ver­abil­i­ty, great pen­e­tra­bil­i­ty, improved safe­ty, and high reli­a­bil­i­ty.” After a slow start due to the impact of the ‘Cul­ture Rev­o­lu­tion’, the war­heads entered full-scale devel­op­ment in 1973. By the lat­er 1970s, Chi­na had suc­cess­ful­ly devel­oped two types of hydro­gen war­heads for its strate­gic mis­siles. The DF-3 MRBM and the DF-4 IRBM are capa­ble of car­ry­ing a sin­gle 2,200kg mass, 1,000~3,000kT-yield war­head. The DF-5 ICBM is capa­ble of car­ry­ing a sin­gle 3,200kg mass, 3,000~5,000kT-yield war­head.